Honey, go sleep on the couch! Ouch! On Saturday Charles drove me to the grand opening of Mill City Antiques in Manchester, New Hampshire. The shop is located in a renovated mill building on the Merrimack River. The building is magnificent and the shop is wonderful. For some nice pics of their shop peruse their Facebook page. We live in Massachusetts, an hour south of Manchester, yet the first booth I walked into I was greeted with a hug by a lady I know from another Manchester shop on Elm Street. I was in my element. Old friends and old treasures surrounded me. 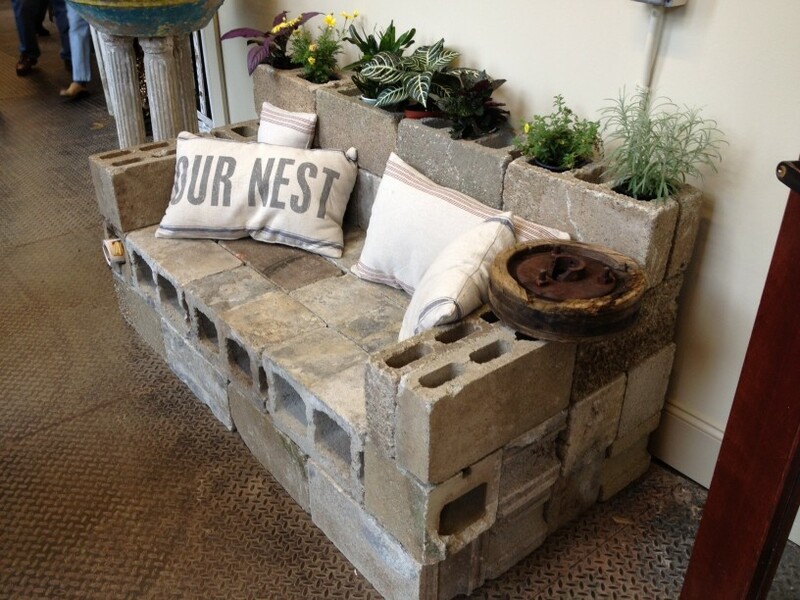 When we entered the shop, this Cinder Block Sofa was by the door. Charles was quite fascinated with it. He imagined how cool it would be in the garden, with every hole stuffed with soil and plants. He is pondering the viability of building one at our cottage. The challenge – our narrow lot. We live on a long and narrow lot with no room for even a lawn tractor on either side of the cottage. If Charles is nice maybe one of the neighbors would permit him to back his truck down to the backyard on their lawn. Otherwise every block has to be carried 150 feet to the back. After lugging all this material that far, perhaps Charles will be tired enough that he could take a nap – even on a cement couch.